42nd Street Moon, who generally presents little known Broadway musicals of the past, is now presenting a brand new, charming musical for the holiday season. Scrooge in Love! 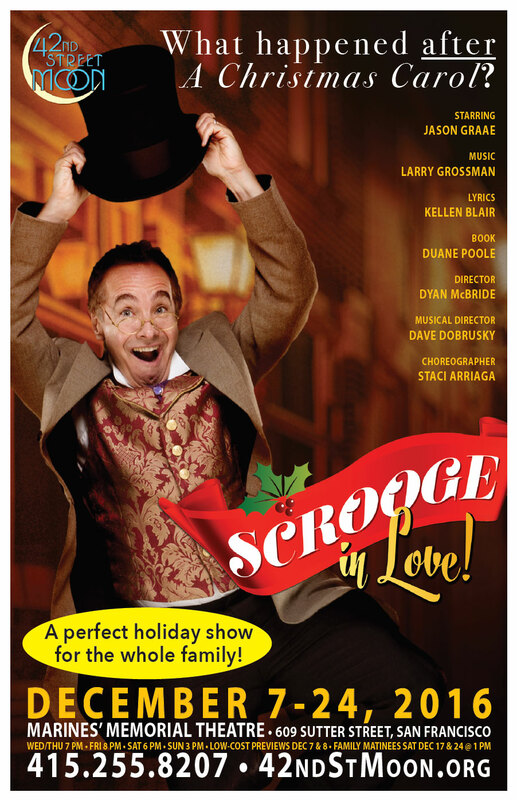 is a delightful and charismatic musical about everyone’s favorite yuletide grumbler, Ebenezer Scrooge. Larry Grossman, the composer of Snoopy! and Minnie’s Boys, has written a most enjoyable score that sometimes reminds me of Richard Rodgers. There are sparkling lyrics by Kellen Blair and an entrancing book by Duane Poole. The songs are nice hummable tunes. Duane Poole captures the magic of the Dickens story while finding effective ways of filling it out. The incomparable Jason Graae brilliantly stars as the sourpuss Scrooge. http://duanepoole.com/wp-content/uploads/2017/01/42nds_Scrooge_In_Love_227.jpg 1001 1500 Duane Poole http://duanepoole.com/wp-content/uploads/2014/10/duanepoole4.png Duane Poole2015-12-02 18:29:452017-01-16 18:34:08Scrooge in Love! is a delightful and charismatic musical! Only in San Francisco will theatregoers find the Ghosts of Christmas Past, Present, and, yes, even Future dancing together on one stage. The mysterious figure clad in all black bops its head back and forth in just one of many surprising delights awaiting audiences throughout new musical “Scrooge in Love!” 42nd Street Moon gives the “Christmas Carol” sequel a perfect premiere at the intimate Eureka Theatre, now through December 13.
http://duanepoole.com/wp-content/uploads/2014/10/duanepoole4.png 0 0 Duane Poole http://duanepoole.com/wp-content/uploads/2014/10/duanepoole4.png Duane Poole2015-12-01 18:34:422017-01-16 18:37:09Many surprising delights awaiting audiences throughout new musical "Scrooge in Love!"